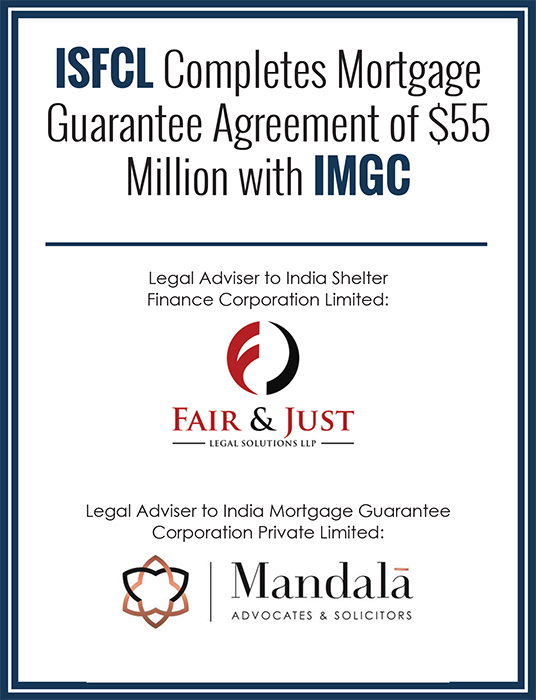 Fair & Just Legal Solutions LLP (FJLS) represented and advised India Shelter Finance Corporation Limited (ISFCL) regarding a mortgage guarantee transaction ($55 Million approx.) as entered into between ISFCL and India Mortgage Guarantee Corporation Private Limited (IMGC) – India’s first mortgage guarantee company. IMGC was represented by a team led by Raghuram Raju, Founder and Partner at Mandala Law Offices. ISFCL offers credit to middle-income households to acquire new housing or to extend and improve their current housing. It aims to improve the quality of living standards of middle-income families by providing affordable home loans. FJLS is a distinguished full-service Indian legal consultancy firm, headquartered in Noida. The firm has a wide domestic presence in New Delhi, Mumbai, Bangalore, Chennai, and Gurgaon. The firm’s core practice areas include Mergers & Acquisitions, Private Equity, Capital Markets, Banking & Finance, Regulatory & Policy, Corporate Commercial, Taxation and Dispute Resolution.